Perfect for game day! 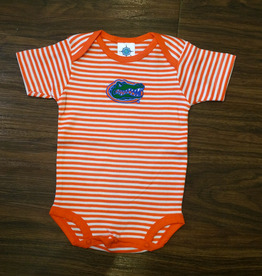 This adorable little orange and white striped onesie embroidered with the University of Florida logo is perfect for your little gator. GROWL, baby Gator! 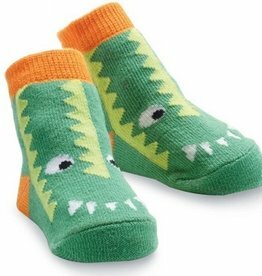 Woven alligator sock bears zig zag scales and not-so-scary teeth. Perfect little box topper on your baby gift. 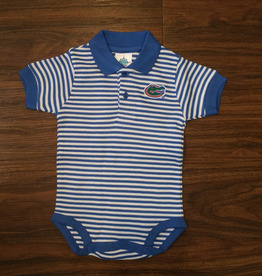 This adorable little onesie with short sleeves and a polo collar is just right for your little gator. 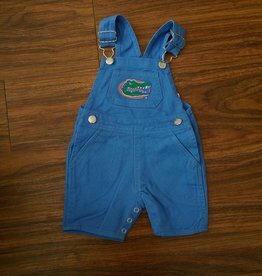 These short-legged blue overalls are perfect for your little gator. The front pocket is decorated with Albert the University of Florida mascot. 100% Cotton. Machine wash warm, tumble dry. This gift set contains an appliqued onesie and a coordinating fabric burp pad. The onesie is size small and fits a baby weighing 13-18 pounds. It comes beautifully packaged and tied with a grosgrain ribbon.